Posted: 2011.07.30(Sat)4:41 Post subject: Cichlid ID? I wondered if somebody could ID a fish for me? It was in a tank with a group of Convicts at the LFS marked as a "spotted cichlid". 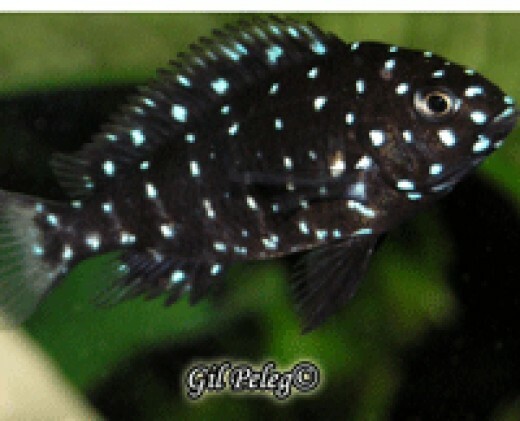 Same body type as a convict and it was a beautiful mat black with blue spots and yellow eyes. Sorry if it doesn't narrow it down much but the LFS wouldn't allow picture taking and they couldn't tell me much about the fish. Really interested in buying it but I always like to do my homework first. Any help would be much appreciated. Could it have been a juvenile Tropheus duboisi ?